By bed time last night I had the scarf restored to where I had ripped it back from, plus a tiny bit. I had ten pattern repeats done (the pattern calls for 13) and I laid it down to admire my handiwork with a sigh. It’s a large psychological barrier and always good to leap it and overtake the unpicking part, is it not? And that was when I noticed it, the third pattern repeat – the THIRD! By this morning I knew that I had to do it. RrrrrrrrrIP………. All the way back to the third lace row. Not as bad as yesterday. Could have been worse. I carefully set the error right and then went to start the breakfast porridge, feeling a little virtuous and a great deal mad. I mean, who knits before breakfast? Only a fool, I am sure. After breakfast, I began again, feeling rather like this project was about to make airborne contact with a structural feature of the house. I don’t understand it. I am a reasonably competent knitter. 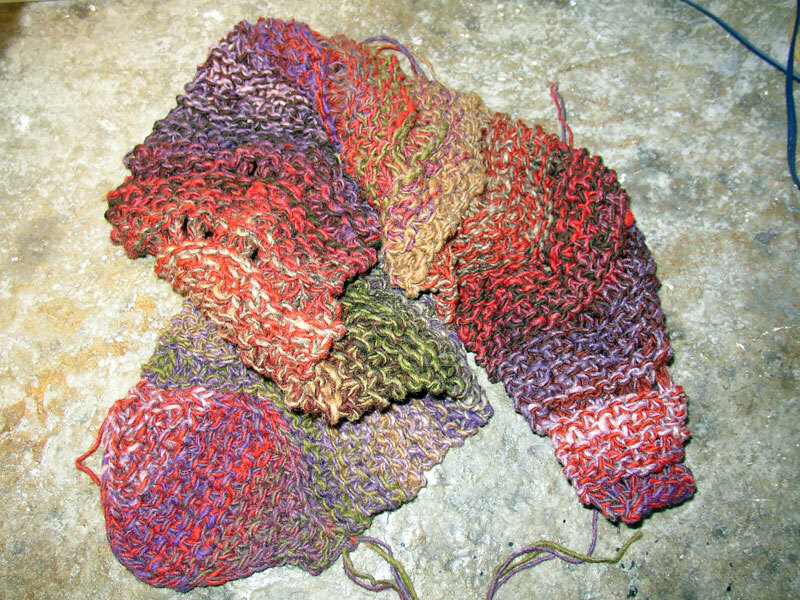 I might have taken a twenty year break out of a knitting career of (*cough*) (many) years, but I can do better than this, and have done so recently. I took one of these out to fondle (hmm, must photograph a completed one) to remind myself that I can beat this little bugger. I can knit socks. In 4ply. 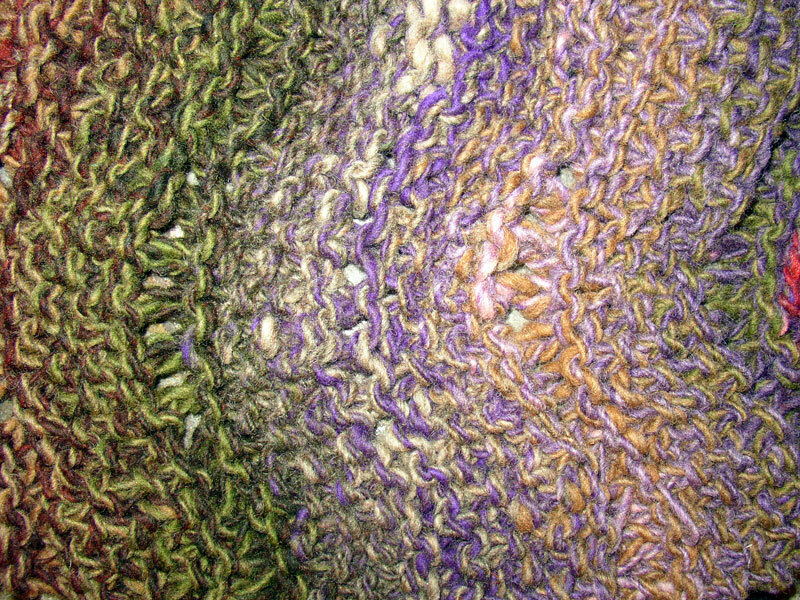 On four/five 2.25mm needles. In Lace, goddamnit. 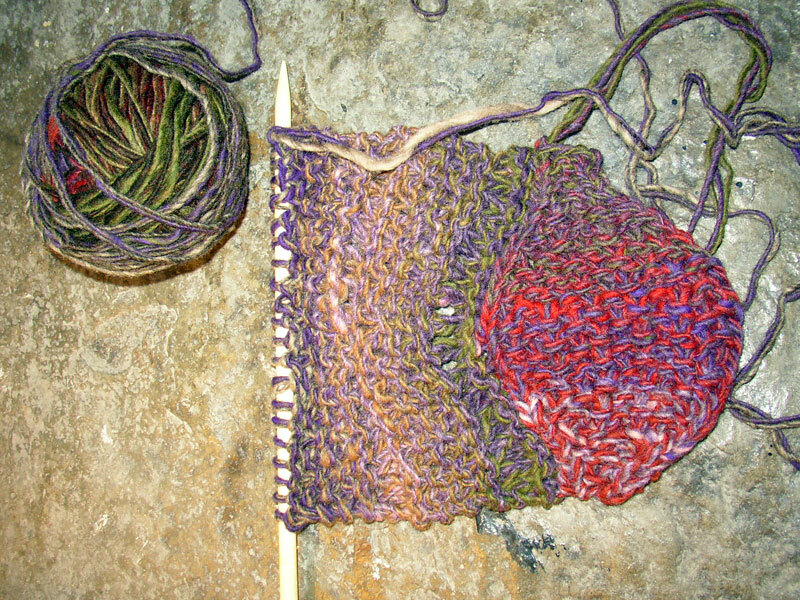 Why can’t I do this simple scarf, in DK, knitted on two monster needles? Is it the lack of light? We are at Latitude 59, and at this season the days tend to be a little on the dim side – made worse by cottage windows. 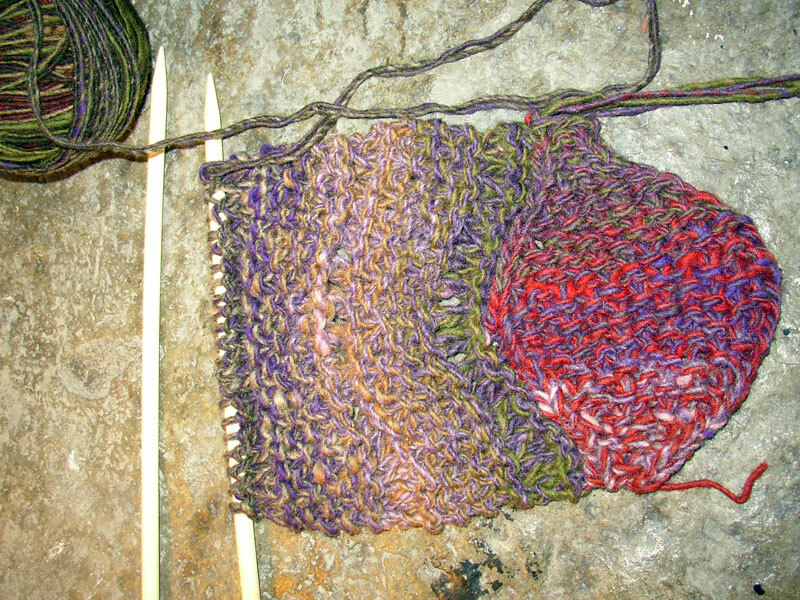 I’m knitting with dark yarn and with two shades mixed, that makes the stitches difficult to see, I admit. And then there’s Nell, and my constant refrain of “just a minute, only one row to go, and then I’ll take you out.” I’ll admit it, she can be most distracting. Or maybe it’s just all too frequent “senior moments” – that seems very likely! Sadly, I think it may simply come down to overconfidence and lack of engaging brain before engaging fingers. I think I just switch off and lose track of where I am in the pattern. Whatever it is, it is driving me crazy. It went reasonably well thereafter, with a just a few tinked rows each time I realised I had missed a line four out yet again. And by the time I began to make my lunchtime chilli non carne, there it was, up to eleven repeats and the end of my first pair of balls. 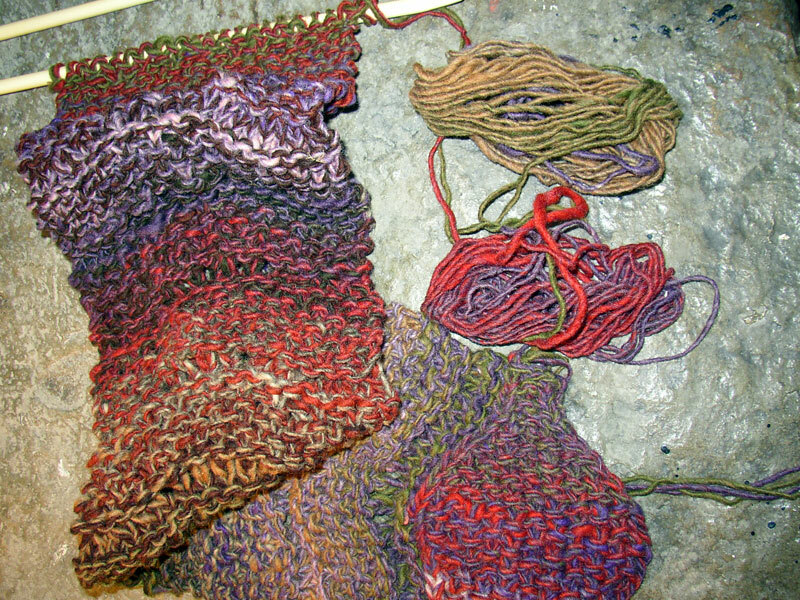 …I actually contrived to get the first half completed and off the needles. 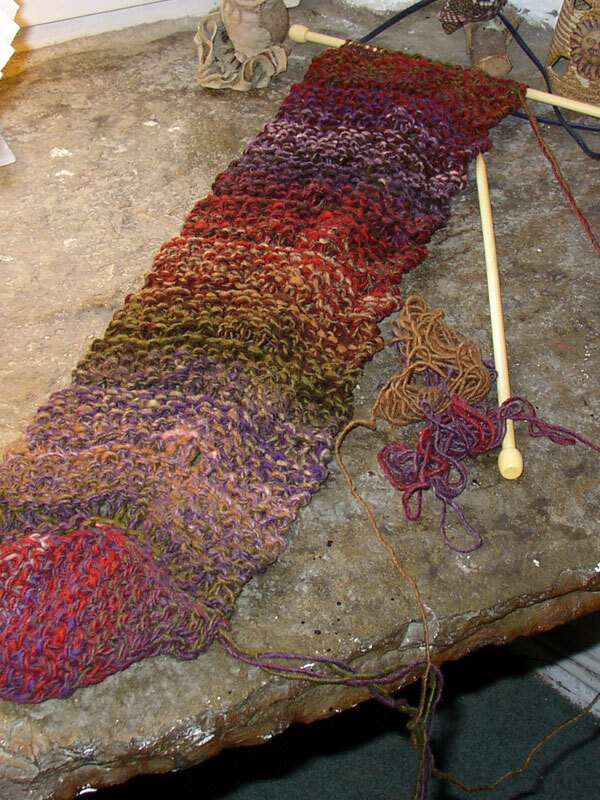 It is now ready to pick up the remaining side of the centre section in readiness for knitting the second tail. I haven’t had lunch yet. Somebody is having similar problems with a recalcitrant car. We shall eat once the starter motor decides to a) go onto the car and (b) actually start the engine.